Cushion cut diamonds are one of my personal favorites. Just joking, who am I kidding?! I LOVE all diamonds! Today I want to talk about cushion eternity rings. Here at deBebians, we offer a variety of diamond eternity rings in various shapes, sizes and qualities. While it seems like the most commonly purchased eternity ring is the round diamond eternity ring, be sure to not overlook a cushion eternity ring. If you are looking for an eternity ring similar to a round, but with a little something ‘extra’, check out our selection of cushion eternity rings. You won’t be disappointed you did. This is our 5.10cttw cushion eternity ring available in gold or platinum. Depending on your finger size, this cushion eternity ring will feature approximately 17 diamonds with each cushion diamond weighing about 0.30ct. This is our highest quality cushion eternity ring with the diamonds being F-G color and VS clarity. Not too long ago, we manufactured two of these cushion eternity rings (for the same client) and sourced all the diamonds from Israel. If you prefer a slightly smaller cushion eternity ring, this is it! At 2.60cttw, this cushion eternity ring features about 26 cushion diamonds each weighing approximately 0.10ct (exact number of diamonds will depend on your finger size). This particular style features G-H color and SI clarity diamonds so they will be near colorless and eye clean (meaning you have to look under magnification to view the inclusions). This cushion eternity ring makes a great wedding band or anniversary band. You can even stack it alongside other rings you currently wear. When searching for an eternity ring, don’t forget to consider cushion eternity rings. 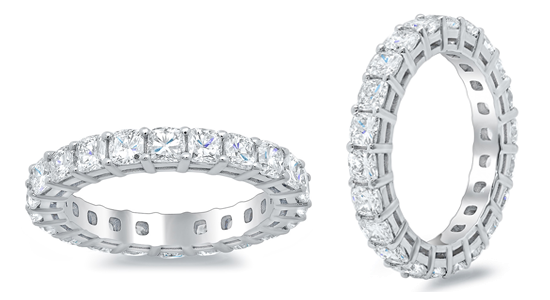 They offer similar sparkle to a round, but in my opinion, just give the eternity ring a little something extra. We offer a variety of sizes and qualities so you should have no problem finding what you are looking for. 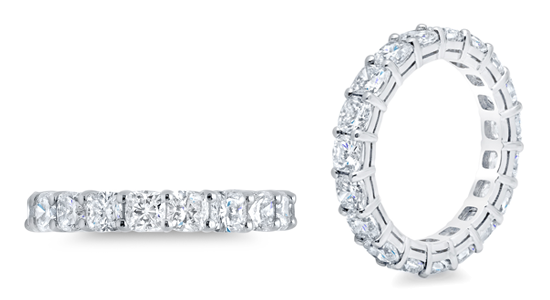 Also, if you want a bigger look for not as much money, consider a Forever One moissanite cushion eternity ring. More on Forever One moissanite cushion eternity rings another time!